Easy pick here. 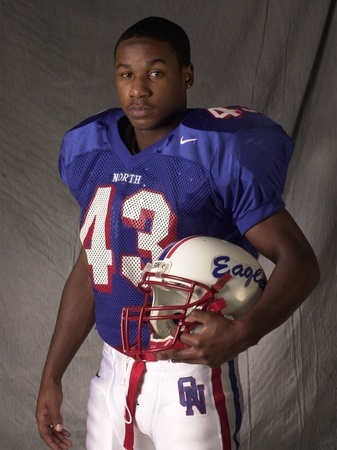 Sproles combined to rush for 5,230 yards (a then Olathe North record) and 79 rushing touchdowns (a then Kansas record) during his time with Olathe North. His efforts helped lead the Eagles to state championships in 1998 and 2000, and he was given the Simone Award in 2000. After an All-American career at Kansas State he's gone on to have major success in the NFL with the Chargers and the now with the Saints. Franklin was a rushing yardage machine for Olathe North, despite the fact that his running style was less than orthadox. As a sophomore he rushed for 1,142 yards and 16 touchdowns. He followed that up by rushing for 1,971 yards and 22 touchdowns as a junior, then he hit the pinnacle rushing for 2,803 yards and 31 touchdowns as a senior in leading Olathe North to a state title while also claiming the Simone Award. He broke Sproles' rushing record at Olathe North and he now holds the title with 5,916 career rushing yards. "Mo Mack" as he was known by the K-State faithful went on to enjoy success as a linebacker at the next level, but he was an absolutely dominant running back at Olathe North. He didn't start at running back until his senior season because he was playing behind Sproles, but he no trouble taking the torch when he was called on to do so. As a senior he rushed for 2,089 yards and 24 touchdowns, leading Olathe North to a state title and winning the Simone Award in the process. Bell spent one season as Andre Jones' understudy in 2004, before taking over as Olathe East's primary ballcarier in 2005. The transition went extremely well for the 5-foot-7 speed demon, as he rushed for 25 touchdowns and over 1,800 yards as Olathe East made it all the way to the 6A title game. Olathe East lost a bunch of talent to graduation after the 2005 season, so naturally Bell became the focal point of defenses in 2006. 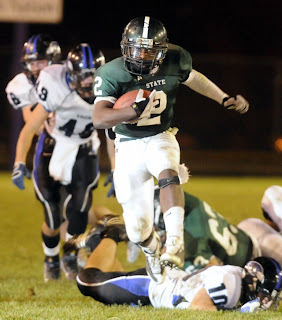 He still did quite well as a senior, rushing for 1,717 yards and 16 touchdowns. Torain, like Sproles, is currently playing in the NFL where he is a member of the Washington Redskins. His time in the NFL has come after a successful collegiate career in which he spent time at Butler C.C. as well as Arizona State. Torain wasn't always a well-known commodity, however. In fact, he didn't really blow up on the Kansas City high school scene until his senior year when he came out of nowhere to rush for over 1,900 yards and 25 touchdowns. His efforts helped SM Northwest to a 9-2 record and a Sectional Round berth. Gore doesn't carry the cloute of many of Olathe North's other famous running backs and that's probably because he didn't win a Simone Award, but he was one of the best running backs of the past 11 years in the league. His hallmark moment came in the 6A state title game against Hutchinson when he was a junior. He carried the ball 32 times for 175 yards and a touchdown, and it was enough to give the Eagles the victory. As a senior he led Olathe North to another title appearance, rushing for over 1,500 yards. When you watched Bouknight run the football there wasn't anything that really jumped out about him. He didn't have the speed of his precessors (Sproles and Mack) and he wasn't exactly physically imposing. His will to succeed, however, was his greatest strength. Opposing Sunflower League coaches probably felt they had finally caught a break once Mack graduated, but Bouknight turned out to be just as much of a headache, rushing for 2,793 yards and 34 touchdowns as a senior in 2002. He led Olathe North to the 6A title, and he was awarded the Simone Award at season's end. Harris has never received his due because he was playing at the same time as guys like Sproles and Mack. Also, his team was knocked out of playoff contention in both his junior and senior seasons because they had to play Olathe North in districts and at the time only one team qualified from each district. In nine games as a junior Harris totaled 1,018 yards and 21 touchdowns. In a nine-game season as a senior he rushed for 1,484 yards and 28 touchdowns. If Hunter had run been two inches taller, 20 pounds heavier, and .2 seconds faster, he would have been on the rader of every major college football program in the country. He ranks up their with Sproles as the shiftiest running back I've seen in the Sunflower League, and he just had the "knack" that all of the great running backs have with the ball in their hands. His numbers were solid--he rushed for just under 2,800 yards in two years as the Free State starting tailback--but quarterback Camren Torneden carried the ball quite a bit, and in a more pro-style offense Hunter could have easily been a 2,000 yard back. Barnett has gone down in SM West lore as one of the best players in Vikings history and still to this day he is the benchmark for what their running backs strive for. Barnett struggled as a junior, rushing for just over 500 yards in a tumultuous 2-7 campaign. Fast forward to 2004 and Barnett matured into one of the best running backs in the city. 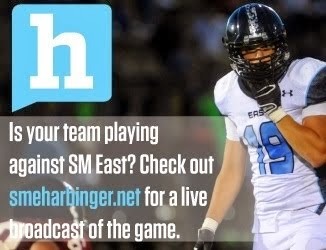 He rushed for just over 1,900 yards and 18 touchdowns on the season, helping SM West to a 9-3 record. To this day I haven't seen a running back carry as much of a team's offensive workload as what Barnett handled in 2004. I feel Brandon Willingham should have a place on this list. Rushed for around 2900 and 30 Tds in 2 seasons, one as a back up. I'd probably take off either Justin Gore or DJ Barnett (Sorry, Eli I know he's your boy). For him. Having seen all three of them play, I think I'd just rather have Willingham over both of them. my only issue with this site it seems like they forget about the players in the 90's, too bad the social media wasnt as popular as it is today. I played against some great backs in the 90's Arland Bruce, Thomas daniels, Pat Phelps, Eniak Mpwo, Henri Childs just to name a few but i guess those players are all forgotten. 1.) I left Willingham off the running backs list because I always thought of him as more of a multi-dimensional type player, and I plan on including him very high on the "athletes" list later on when I release it. I could have put him on both lists... but I just felt he was on the fringe for the top 10 of RBs and he'll get his due with the athletes. 2.) There were incredible talents in the SL in the 1990s (I actually lived near Henri Childs and I knew him before he went on to college), but it's nearly impossible to cover them. First off there is little to no archived coverage on the web from those years. Secondly, alot of the information I disseminate on here is based on memory, but I was, at the oldest, 10 in the the late 90s so my memory of those days does little good in that regard. You really forget just how big the hype was around Bell going into 06. Was heading to KState, next sproles, etc... Then no one said his name again. Tough deal. Bell didn't do anything in college (because he was too small) but that doesn't take away from the fact that he still rushed for over 3,500 yards and 40 touchdowns at Olathe East. 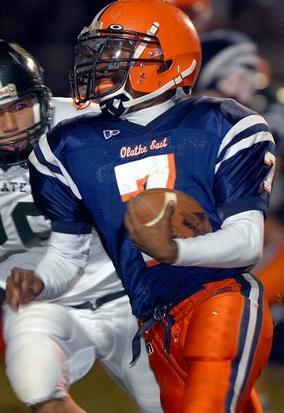 Olathe East was good in 2006, but SM West and Free State were better and so naturally they received the majority of the league attention that year, and rightfully so. Oh I agree he deserves it. I'm just saying its crazy how we never heard from him again. Same with Andre Jones. I thought they would both be stars in college. I think it's awesome that Darren Sproles caught Drew Brees' record breaking pass for a TD. That's pretty epic.